A dental crown covers the entire visible portion of your tooth above the gum line. Our Kalamazoo, MI dentist may recommend a dental crown to restore the function and appearance of a weakened tooth. A dental crown saves a tooth that’s been weakened by trauma or decay. We may also recommend porcelain crowns to cover teeth that are severely stained or discolored. The dental crown procedure typically takes two trips to our office. First, we’ll need to remove some tooth structure so your crown can sit comfortably over top. Next, we’ll take dental impressions to send to the lab where your dental crown will be made. Our dental crown dentist in Kalamazoo, MI will place a temporary cover over your tooth while you wait for your crown to be ready. When you return for your second appointment, we’ll be able to replace your temporary crown with the permanent one. Our dentist will check the color, size, and shape of your tooth crown before bonding it into place. We’ll also check your bite to ensure your dental crown fits properly. Care for dental crowns like you would natural teeth. The American Dental Association recommends you brush your teeth twice a day for two minutes at a time. Our dentist also recommends that you floss once daily to remove plaque hiding in between teeth. Plaque loves to hide where toothbrush bristles can’t reach, which is why it’s important to invest in your oral health every day by practicing good dental hygiene. To maintain a healthy smile, you’ll need to schedule a teeth cleaning and oral examination every 6 months so we can monitor the condition of your tooth crown. We offer dental crowns and other restorative dentistry to help you smile with confidence. 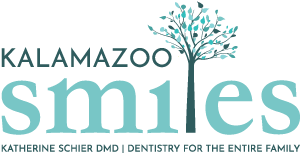 To request an appointment with our Kalamazoo, MI dental crown dentist, call Kalamazoo Smiles at (269) 353-3700.